Theologians teach us that man was created to enjoy God. But can we know God directly in this life? Like other mystics of the fourteenth century, John of Ruysbroeck thought so. He even taught that we could become one with God. "To comprehend and to understand God above all similitudes, as he is in himself, is to be God with God, without intermediary. Whoever wishes to understand this must have died to himself, and must live in God, and must run his gaze to the eternal Light in the ground of his spirit, where the hidden truth reveals itself without means." To Ruysbroek's contemporaries, this sounded dangerously like pantheism. Pantheism teaches that God is everything and everything is God. John was quick to assure his readers that what he meant is that we can become one with God in love,--not in our nature or essential being as Christ was. John was just eleven when he left home without even saying good-bye to his pious mother. He wanted to be with an uncle who was eager to live the kind of simple life that he imagined the early Christians lived. John was infected with the same ideal. Like his uncle he desired a deeper spirituality. In due time John was given a church position and his mother moved to Brussels to be near him. Until he was fifty, John lived in Brussels. Then he joined his uncle and a like-minded man in a hermitage at Groenendael. So many men followed them that they had to organize themselves into a regular church body. John began to write in order to battle the teachings of false mystics. He wandered the woods with a note pad, thinking about God. When any understanding came to him, he wrote it down. Although he was a Fleming and wrote in his native language, rather than in Latin, his writings had a great impact because they were translated into the major languages of Western Europe. Mysticism did not make John impractical. On the contrary, he was so good at helping others see how they ought to act in given situations that many crowded him for advice. His writings were eagerly copied and passed on to others. Gerard Groot, one of the great Christians of the age, became his close friend. 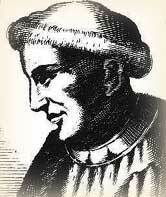 Through Groot, John also influenced Thomas á Kempis, author of The Imitation of Christ. Tauler, who would become one of the most famous German mystics, visited the hermitage and was deeply influenced by John. John died on this day, December 2, 1381at Groenendael. In 1908 the pope declared him blessed. "Ruysbroeck or Ruusbroec, Bl Jan van." The Oxford Dictionary of the Christian Church. Edited by F. L. Cross and E. A. Livingstone. Oxford, 1997. "Ruysbroeck (Ruusbroec, Ruysbroek), Jan Van." New Schaff-Herzog Encyclopedia of Religious Knowledge. Grand Rapids: Baker Book House, 1954. Scully, Vincent. "Blessed John Ruysbroec." The Catholic Encyclopedia. New York: Robert Appleton, 1914.